The ancient Maya established their cities in the rainforest, played games that went on for days, and are famous for their knowledge of the stars. The idea of time fascinated them. They chewed gum, filed their teeth and raised bees without stingers. 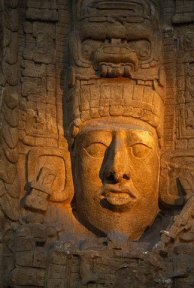 Scholars agree the Maya were the most advanced of all ancient Mesoamerican cultures The Maya originated in Yucatan in Mexico, the area around the resort beach city of Cancun is today. They developed astronomy, calendar systems and writing. 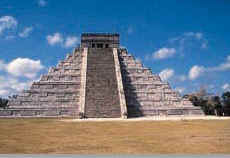 They built elaborate pyramids and observatories, all without metal tools. They were highly skilled as potters and weavers Their centers began to decline around AD 900, for reasons still unknown. Some of the centers continued until the Spanish arrived in the 16th century. For more information on Cancun, Cozumel. LaPaz and more information on Mayas, go to mexico-guides.com .